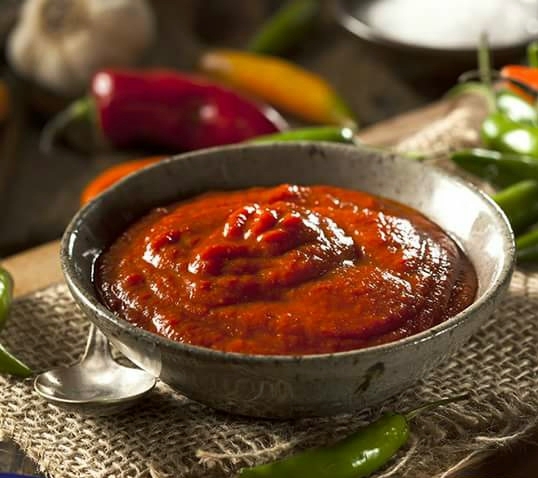 Warning: This chili sauce is for serious chili aficionados!! In a saucepan, heat the oil over medium-high heat. Add the garlic and onions. Saute until the onions are lightly browned and crispy. Stir in the crushed tomatoes and chilies. Bring the sauce to simmer and reduce the heat to low. Add the fish sauce, vinegar, and sugar. Stir to mix well. Cook for another 5 - 8 minutes. Remove the sauce from the heat and set aside to cool completely. Once cooled, transfer the sauce to the blender and blend to a smooth consistency. Add more sugar, vinegar, and water to suit your preference. Pour the sauce into a jar, completely seal the jar and keep the sauce for future use. NOTE: Reduce the amount of chilies used in the recipe for a more mild sauce.